For forty years, Dr. Speirs taught zoology at the University of Toronto. He published .meticulously researched articles on bird behavior. He was the author of Birds of Ontario Country, Birds of Ontario, and co-author of A Naturalists' Guide to Ontario. 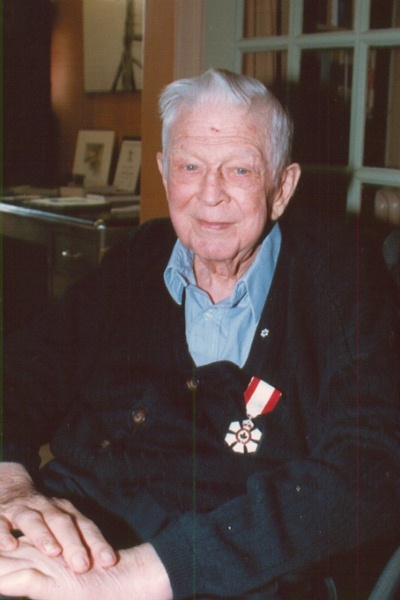 He was a founder of the Federation of Ontario Naturalists and several birding clubs. But what made him an icon among birders and all lovers of wildlife was his generousity of spirit. He shared both his expertize and his personal resources. He helped purchase Thickson's woods in Whitby and gave seven of his own acres to the Altona Forest. Within the forest, a protected ecological reserve has been set aside to honor Murray and his wife Doris, his longtime birding companion. He was a mentor to the next generation of naturalists and friend to wildlife artists Robert Bateman and Barry Kent MacKay. Last year, at age 91, he was named a Distinquished Ornithologist by the Ontario Field Ornithologists; was recognized with a Lifetime Achievement Award from the City of Pickering; and --his biggest thrill--received the Order of Canada from the hands of Governor-General Adrienne Clarkson. To the time of his death in early September, he still watched with interest the chickadees and cardinals that came to the feeder on his window. Murray Speirs was my uncle, and to me his greatest contribution was as an environmentalist ahead of his time. When he was only 15, living at my grandparents home on downtown Wolfrey Avenue, he bought the first of the black notebooks in which he recorded every bird he saw or heard until the end of the century (His first was a herring gull). But his interest was much deeper than recording new species for a life list. The little notebooks, now occupying several shelves, are crammed with expert observations of bird behavior and habitat. "He didn't just identify birds, he studied their numbers , behavior and habitat,'' says Bruce Falls, a lifelong friend and fellow zoology professor.